Dr. Ford highlights the several important variables that influence both the justification to vaccinate for feline infectious respiratory disease and the quality of immunity derived from vaccination. None of the feline respiratory vaccines completely prevent infection or development of a carrier state. They do, however, mitigate the severity of respiratory disease. Table 2 summarizes feline respiratory disease vaccine types and routes of administration. However, several important variables influence not only the justification to recommend vaccination but the quality of immunity an individual cat derives following administration of a vaccine. Feline herpesvirus-1 (FHV-1) is the respiratory pathogen that causes the most severe clinical signs in cats. Clinical Signs. Sneezing, rhinitis (often times ulcerative), tracheitis, conjunctivitis, keratitis, and oral ulceration characterize acute infection (Figure 1). Occasionally, localized skin lesions occur. 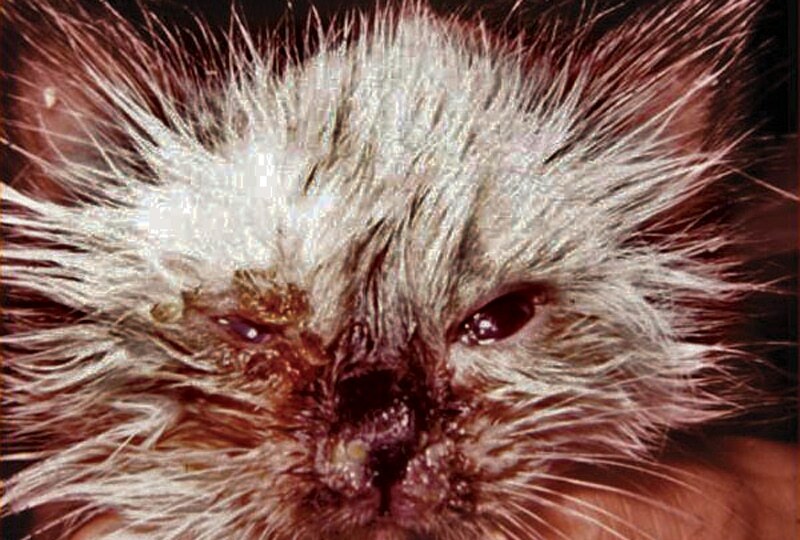 Feline calicivirus (FCV) infection is highly prevalent in the feline population. Over 40 strains of FCV have been identified, some of which mutate to become highly virulent, or virulent systemic (VS), FCV strains. Disease Course. Following recovery from the more common acute FCV infection, cats may develop a chronic carrier state, with persistent viral shedding, lasting from weeks to years. Chronic carrier cats may manifest paroxysmal sneezing, nasal discharge, or chronic gingivitis/stomatitis (Figure 2). Some affected cats have no clinical signs but shed virulent virus continuously from the oropharynx, posing a significant risk to susceptible cats/kittens. Chlamydophila felis, a gram negative intracellular bacterium, is a minor pathogen in the spectrum of agents that cause feline infectious URD. Chlamydophila felisClinical Signs. Although sneezing and nasal discharge can occur during infection, conjunctivitis with chemosis and mucoid ocular discharge are the most common clinical manifestations (Figure 3). Disease Course. Clinical signs typically develop 5 to 10 days following exposure. Chronic carrier cats have been identified. Bordetella bronchiseptica, a gram negative bacterium, has adapted to the respiratory tract of several species, including humans, and exists as part of the normal respiratory flora of many cats and dogs. Clinical Signs. Clinical signs of feline bordetellosis are characterized by cough and, occasionally, bronchopneumonia. Ocular and nasal discharge have also been observed. Three types of combination FHV-1 plus FCV vaccine are available; an inactivated, bi-valent FCV vaccine is also available. Most vaccines sold in the U.S. and Canada are combined with other vaccines (eg, feline parvovirus or feline leukemia). Modified-live virus (nonadjuvanted) vaccine is recommended over killed virus products for routine use. An inactivated (adjuvanted) bi-valent vaccine, which contains 1 conventional respiratory virus strain plus 1 strain of VS calicivirus, is available in the U.S. and Canada. A study published by the manufacturer has shown that vaccinated cats developed reduced clinical signs following challenge with a homologous FCV strain.3 Additional studies are needed before this vaccine can be recommended for routine use. Onset of immunity following intranasal (IN) vaccination may be faster (by a few days) than that of parenteral (MLV) vaccination. IN vaccines immunize at an earlier age because there is less MDA interference in the upper respiratory tract. A combination feline parvovirus (FPV), FHV-1, and FCV vaccine is recommended for all cats, beginning as early as 6 to 8 weeks of age, regardless of vaccine type. Kittens should receive an additional dose every 3 to 4 weeks until 16 to 20 weeks of age. The extended vaccination age (16–20 weeks) for kittens is intended to avoid interference from MDA associated with FPV. All cats should be revaccinated 1 year following completion of the initial series. Revaccination no more often than every 3 years is recommended for household pet cats living in low-density environments. Annual revaccination is indicated for cats housed in high-density environments, where risk for exposure to respiratory disease is high. FVURD continues to represent a significant health threat to the feline population. Mortality is typically low among infected cats, especially if supportive medical therapy is available. Morbidity, on the other hand, is particularly high…despite routine vaccination. Cats housed in high-density environments are at significant risk for infection. Individuals responsible for the management of these populations face significant financial risk associated with treating large numbers of affected cats or the need to depopulate. Both inactivated (killed, adjuvanted) and attenuated (avirulent live, nonadjuvanted) vaccines are available as an aid in preventing clinical signs associated with Chlamydophila felis (formerly, Chlamydia psittaci) infection. One vaccine is currently available as an aid in the prevention of Bordetella bronchiseptica infection in cats. The product is an avirulent live bacterin (monovalent, non-adjuvanted) approved for IN administration only (no parenteral administration). Cats should not receive the canine B bronchiseptica vaccine because its constituency is different than that of the feline B bronchiseptica vaccine. C felis vaccines are typically combined with various other vaccines. Indications for administering vaccine are generally limited to cats residing in multiple-cat households, where the risk for exposure to C felis has been confirmed. If indicated, 2 initial doses should be administered 3 to 4 weeks apart; annual vaccination is recommended for cats in which the risk for exposure is sustained. Indications for vaccinating cats against B bronchiseptica are generally limited to high-density housing environments, where the risk for exposure to infected cats or dogs is known. Kittens appear to be at greatest risk, especially if coinfected with FHV-1 or FCV. A single dose (0.2 mL), administered into 1 nostril, can be administered as early as 8 weeks of age; annual revaccination is recommended for cats at risk for exposure. Cats are not expected to develop protective (sterile) immunity following vaccination against either C felis or B bronchiseptica.7 Vaccination is only expected to mitigate, not prevent, clinical signs. B bronchiseptica can be recovered as part of the normal bacterial flora from the respiratory tract of healthy cats. The role of B bronchiseptica as a single-agent infection in cats with respiratory disease has not been determined; therefore, it is particularly difficult to assess disease risk and indications for vaccination. The limitations cited justify categorizing these vaccines as noncore. Additionally, both C felis and B bronchiseptica are susceptible to doxycycline (10 mg/kg Q 24 H, or 5 mg/kg Q 12 H, PO for 7–10 days), which can be administered to treat an active infection. Adjuvant: A chemical, microbial, constituent, or mammalian protein commonly added to killed (inactivated) vaccine to enhance the immune response to a selected antigen. Attenuated (avirulent live and -live): Vaccine that contains the live virus or bacteria as the immunizing antigen. The virulence of the organism (antigen) is reduced, but is still capable of infecting cells and replicating following inoculation. Killed, or inactivated: Vaccine that contains killed virus or bacteria as the immunizing antigen; following inoculation, the antigen is incapable of infecting cells or replicating. Cats living inside and in households with low population density can be protected if revaccinated every 3 years. Cats residing in high-density populations are likely to have a high exposure risk and should be revaccinated annually. Cats, especially kittens, residing in high-density populations (shelter-housed cats, breeding colonies). Vaccination of individual household cats living in low-density environments is unlikely to be necessary, and veterinarians should use discretion when recommending vaccination against chlamydiosis and bordetellosis. Physical separation of vaccinated cats from nonvaccinated cats and, when feasible, separating cats with a known history of respiratory disease is important in reducing the risk of exposing healthy cats to chronic carrier cats. Also, separating susceptible kittens from the adult (chronic virus carrier) population is fundamental in reducing the incidence of acute infections, particularly with FHV-1 and FCV. Within high-density populations, feeding should be ordered in such a way that healthy cats are fed first and cats with signs of upper respiratory disease are fed last. Ideally, disposable gloves should be used between cats or between cages of cohoused cats. Disposable feeding bowls should also be used; however, if using washable food bowls, soak bowls in fresh solution of 1 part household bleach to 30 parts water (1:30). Allow bowls to thoroughly dry before using. Why does FVURD continue to pose such a significant threat to the feline population if vaccination against these virus infections is routine and widespread? First, both FHV-1 and FCV are readily transmitted when infected cats are housed with susceptible cats. Second, FHV-1 and FCV vaccines currently sold in the U.S. and Canada do not provide “sterile” immunity. The immunity a cat derives from vaccination does reduce the severity of clinical signs subsequent to exposure and infection; it does not, however, prevent infection nor does it prevent development of a carrier state and viral shedding.1 The immune response to both FHV-1 and FCV vaccination is, therefore, deemed “non-sterile” (regardless of the product used and route of administration). In contrast, the immune response subsequent to feline parvovirus (panleukopenia virus) vaccination is considered “sterile”; vaccinates receive protection from both infection and clinical disease if exposed. How do you reduce the risk for infection? As long as the number of cohoused cats remains low, exposure risk is low, and vaccination offers satisfactory protection. However, as the number of cats within a household increases, the risk that chronic virus carrier (viral shedding) cats will be introduced also increases. 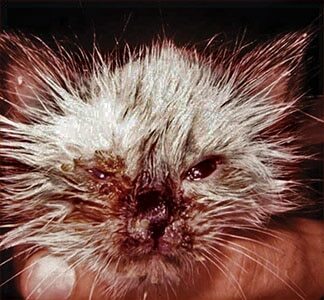 Vaccinated cats, if exposed, become infected and are likely to become chronic virus carriers. 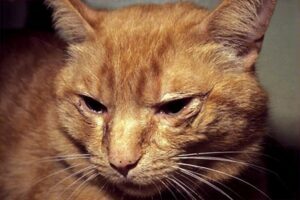 Susceptible, nonvaccinated cats, on the other hand, will become infected and develop the full spectrum of clinical signs of acute-onset upper respiratory infection. To what degree is FVURD prevalent in the feline population? 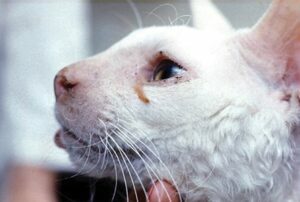 Chronic virus carrier cats are highly prevalent in the population and disease is endemic in high-density populations. In addition, shelter-housed cats and those residing in rescue facilities have high infection rates despite routine vaccination. As the proportion of young, susceptible kittens within the population increases, the risk for serious clinical disease can be expected to increase as well. Adequately designed and maintained quarantine facilities are uncommon; the expense of constructing proper facilities with adequate ventilation, combined with high numbers of entrant cats received at certain times of year, make isolation impractical or ineffective. Segregating healthy, virus-free cats from healthy, virus-carrier cats requires virus isolation and time; neither option is practical in high-density, high-turnover environments. Strict vaccination at the time of intake, either by parenteral or IN routes, is unlikely to prevent infection or development of a virus-carrier state following exposure. Gaskell RM, Dawson S, Radford A. Feline respiratory disease. In Greene CE (ed): Infectious Diseases of the Dog and Cat, 4th ed. Philadelphia: Elsevier-Saunders, 2012, pp 151-162. Coyne KP, Jones BR, Kipar A, et al. Lethal outbreak of disease associated with feline calicivirus infection in cats. Vet Rec 2006; 158:544-550. Sykes J, Anderson G, Studdert V, Browning G. Prevalence of feline Chlamydia psittaci and feline herpesvirus-1 in cats with upper respiratory tract disease. J Vet Intern Med 1999; 13:153. Disease information fact sheet: Feline calicivirus. J Fel Med Surg 2013; 15:Supplementary file. Available online at catvets.com. Huang C, Hess J, Gill M, Hustead D. A dual-strain feline calicivirus vaccine stimulates broader cross-neutralization antibodies than a single-strain vaccine and lessens clinical signs in vaccinated cats when challenged with a homologous feline calicivirus strain associated with virulent systemic disease. J Fel Med Surg 2010; 12:129-137. Scherk MA, Ford RB, Gaskell RM, et al. 2013 AAFP feline vaccination advisory panel report. J Fel Med Surg 2013; 15:785-808. Available online at catvets.com (search Practice Guidelines; 2013 AAFP Feline Vaccination Advisory Panel Report). Masubuchi K, Wakatsuki A, Iwamoto K, et al. Efficacy of a new inactivated Chlamydophila felis vaccine in experimentally-infected cats. J Feline Med Surg 2010; 12(8):609-613. Disease information fact sheet: Chlamydophila felis. J Fel Med Surg 2013; 15:Supplementary file. Available online at catvets.com.